Pictured are (from top to bottom) the touch button versions of the Chronos Digital Game Clock II, Chronos FX and Chronos GX. As of this writing, these clocks are in short supply and extremely hard to find even online. Most of the major dealers list them out of stock or renege on the deal by the time of shipping. You will be pushed a cheaper plastic (albeit nice and cuddly) ZmartFun replacement. Not. The. Same. Curious, I started digging. Information is scarce. The news is bad. There is a legend about a nutty scrabble player who started a scrabble timer business and expanded it to chess by demand … but his heart was never in it. Scrabble, yes, chess, no. The scrabble side of business is booming, the other not so much. The official website is virtually dead, last updated years ago. There are reports of repair delays and the shop not answering the phone. Some say the shop is suffering from chip supply shortage. I dunno. "The Chronos is a Sam Timer w/ the Scrabble function removed and marketed to chess players. It was developed by a Scrabble player named Sam Kantimathi, to market the clock to chess players he removed the Scrabble function (up counting overtime) from the clock and gave it a mythical name Chronos." "They have not gone out of business. The had serious problem with their chip sets and are waiting for new chips in order to keep making clocks." Pictured are three models I somehow happened to get hold of via friends in the States. These were never sold in Europe. The FX I snatched off an American kid playing at WYCC2012 in Maribor, Slovenia. The mother robbed me, but I forked over gladly. 1. 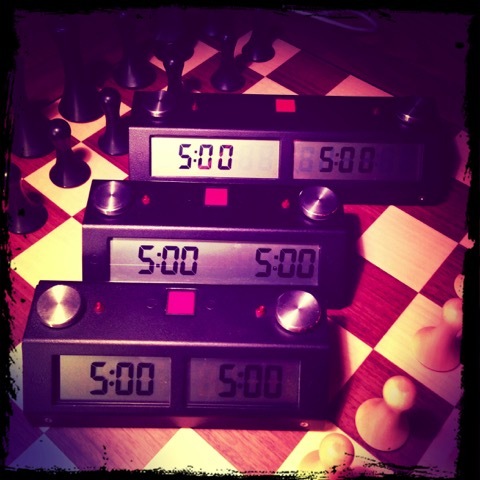 Chronos Chess Clock II: Touch Switch, introduced in 2003, still sold today. 2. Chronos FX Touch, introduced in 2004, discontinued in 2008. Good luck finding this one. 3. Chronos GX Touch, introduced in 2008. Listed at major dealers, but apparently sold out. The Chronos Chess Clock (the long one) is a full featured tourney & blitz modes with the kitchen sink. A bunch of Go and byo-yomi modes. Lots of overhead. Good for serious all around tournament players. All the FIDE modes and whatnot. The FX is the best of the lot for a blitz player. Simple timer modes with a handful of tourney settings. One pane LCD display with unmatched readability. 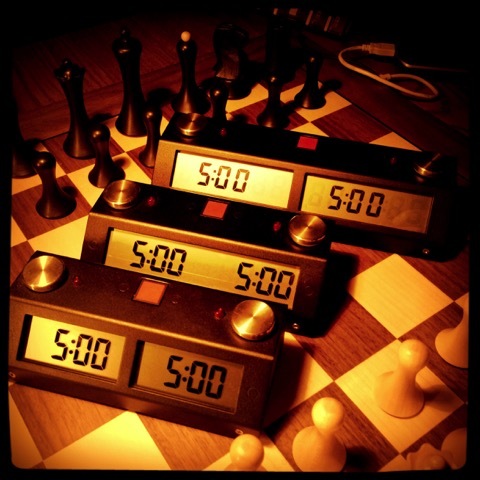 Best chess clock ever. Discontinued. Oddly, there are no videos of the FX on YouTube. The GX is a newer blitz model, functionally same as FX but with a couple of additional byo-yomi timer modes. Same size as GX, but with two LCD panes and a bit different increment/delay/move display. Out of stock at most dealers, but can be found at some web corners for a heavily inflated price.